One might expect an influential, iconic band of Celtic Frost's stature to rough out the 90s with considerable dignity, but if the Nemesis and Power demo, recorded to prod some post-Noise label interest, is any indicator, then the Swiss folded at exactly the right time to avoid humiliating themselves on a level Cold Lake could only have dreamed of. The content of this demo is hands down the most embarrassing and pedestrian songwriting I've ever heard from the band, making their glamorous 1988 faux pas seem glorious by comparison, and Hellhammer seem lucratively sophisticated. Clearly Tom and his troops had run full out of steam, and at best the material here offers a few half-assed special effects that themselves would have required heavy development to pass muster. I realize that Celtic Frost was never some bastion of riffing technicality, but their simplified palm mutes and groove rhythms were generally so well conceived that they compensated via their raw barbarity. Here, the guitars seem like the 'my first thrash riff' collection of some insipid teenager with two weeks training, only the kid in question would never have presumed that they might make for decent songs capable of generating interest. "Devil and the Flesh", "The Man Who Would Weep", "Primeval Rapture" and the 'untitled' track, "Under Apollyon's Sun" (which also appeared on the Parched With Thirst Am I and Dying compilation) all contain some of the least impressive muted noted progressions I have heard in my life, to the point that they make the infant nu- and groove-metal acts of this period seem like skilled composers. The drums are pretty simplistic, without much of the blunt force trauma Mark was meting out on the earlier recordings, and the bass is so antagonistically pathetic that it pretty much copies the worthless guitar lines. I cant chide the band too hard, because obviously they were well cognizant of the fact that this material wasn't going to get them anywhere. Yet the very fact that it exists in even the most amateur, covert form is sad indeed, more evidence of an 80s titan falling to the wayside. 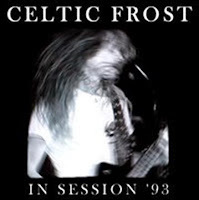 At least Celtic Frost didn't attempt to 'keep up with the times' by mutating into an all out alt rock, grunge, rap or techno industrial project, right?